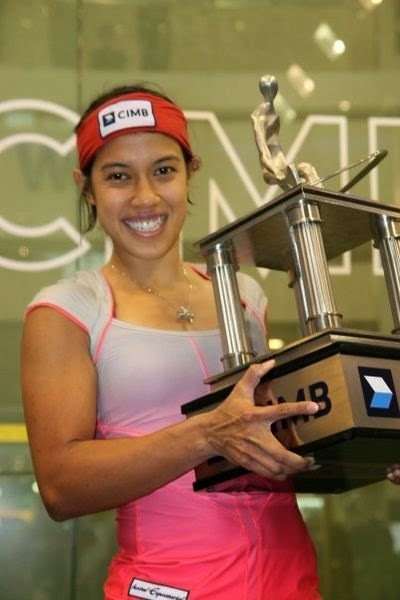 Today I am going to discuss what I would work on if I coached Nicol David. It seems like a fitting topic since I'm heading to Malaysia soon. Obviously she is doing almost everything at the absolute highest quality, but even for one of the greatest players there are things that can be improved. I'm sure this is what keeps her motivated year after year. Many people want to find out just how good they can be? Not very many of us actually achieve our true potential. It takes not just many years of hard work, but a dedication to your craft for a major potion of your life. I could go on and on about what Nicol David does so well. Her consistency, focus, mental toughness, work ethic, determination, her length and fitness are the major qualities that I really admire. Not to mention that she is a brilliant role model not just for young girls, but any squash player. She also appears to be extremely humble and has a great smile :-) It makes you wonder where her will and determination come from. David is proof that you can be small and succeed in squash. But this post is heading in a different direction. It's time to talk about how David can become an even better squash player. David has been on the tour for a long time and is getting near the twilight of her career, but has yet to shows signs of slowing down. I believe that David can continue improving her game for years to come. When you get to an elite level as David has, what she can improve is much less obvious than any amateur, but after watching most of her matches at the recent British Open you could see some of her opponents were able to really work her around the court. I don't remember her opponents looking so comfortable against her a few years ago. I guess this is naturally what happens when you're on the top. Everyone has a team strategizing on how to take you down. Although David is extremely fit and fast, she is still relatively small in stature. So when someone holds the ball or attacks well with a boast she has trouble covering. 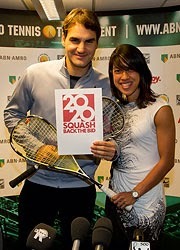 I thought Laura Massaro had a lot of success with her forehand attacking boast on David. I think David is well aware of this fact and is why she really concentrates on keeping her opponent behind her until she has a golden opening. If her opponents are stuck in the back they won't be hitting many winners from there. David has such great length on the glass court that this almost always works, but if her opponents equal her great length she's normally in trouble (yes, as we all are!). I think that David will never be easy to beat because she has such a solid base to her game. She makes very few mistakes and hits good width and length. 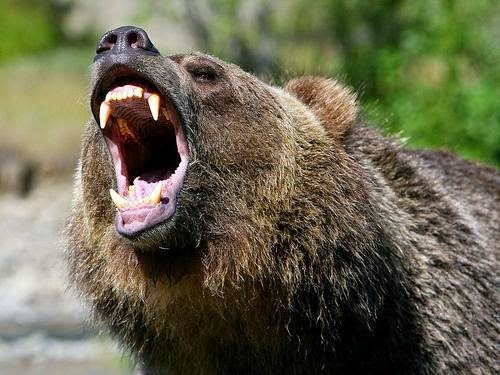 But I do feel that she could be more aggressive and clinical on her volleys. During the British Open I thought David let her opponents off the hook numerous occasions on the volley. There were plenty of times where her opponent was stuck behind her and she just hit it deep again. David appeared to be set up and in position to bring the ball in short. Of course if she goes short and the shot isn't high quality she puts herself in trouble as she again is not that big and many of the top women are deceptive when given time from the front. Obviously this isn't her style, but I'd like to see her play more aggressive on the volley. Not be afraid of making a couple of errors. This brings me to my next point. Watching David play I feel that her opponents can read her very well. It's just a matter of wether David's shot execution is precise enough or not. If your opponent always knows where the ball is going you're looking at very long rallies. She does have a deceptive backhand trickle boast and I would like to see her work on one on the forehand side. I'd also like to see her try some more drives down the middle of the court. She hits such immaculate length that this is definitely something that would make her even tougher to play. I think David could also improve her attacking boast. Some of the top women shape up and look like they are going to drive and then play a 2-wall boast. Some of these women have excellent delay on their swings. Since David has such great length and hits deep almost every time she's in the back if this shot was at all deceptive she would set herself up for a lot of easy points. But of course this leaves her exposed at the front and is a bit more risky than the style she normally plays. The last area I think Nicol David could improve is her serve from the right service box. She does get the ball nice and high with her lob serve, but rarely hits the sidewall. If she hit the sidewall consistently on the 4-wall glad court this would set her up for a lot more quick points. Again, this may appear like a minor-adjustment, but I do think it would make a pretty significant impact to her game. Nicole David is one of the greatest of all time. I almost feel unworthy to write an article about how she could improve. But I thought it would be a fascinating topic. I know one could ask, 'why fix what isn't broke?' And yes I get it and agree. But I believe this is how the greatest athletes think. Elite athletes are never satisfied with where they are and are constantly looking for ways to improve and add new dimensions to their craft. 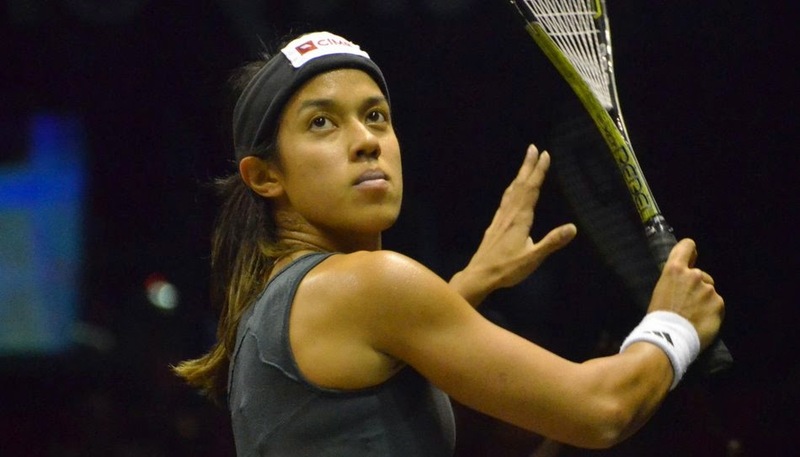 Nicol David isn't going to transform her game into an Egyptian stye. But if we look at Nick Matthew the past few years he has become much more attacking and clinical with his short game. As the competition get stronger I think you need to get them off court sooner so you can be fresher for the later rounds. It would be interesting to know exactly what Nicol David thought of her own game at the moment and what she is currently working on. If she keeps on doing the same thing she should continue to do it slightly better and better. There is no doubt about her work ethic. But with everyone nipping at her heels I'm sure she is thinking of subtle adjustments she needs to continue to make so she can continue to stay at the top. As we saw at the British Open there are a number of women that are capable of beating Nicol on any given day. If feels like the tides are slowing changing. How much longer will David be able to be world #1? I think the one thing she has going for her is that there isn't another dominant person on tour. I think there are a few that are very strong, but the don't get the consistent results that David does. Until one of them do David should be safe at the top of the heap. If I was coaching Nicol David it's safe to say that I would learn a lot more from her than she would from me. It's amazing how much more active I am on my blog when I'm home sick! Anyways, today will be one of my more subjective topics to date. I'm going to talk about the Olympics and a major reason why squash is not included. This reasoning will never be verbally acknowledged by the International Olympic Committee, but the more I think about it the more I agree. Growing up watching the Olympics there are a few things that have stood out; Jamaica sent a bobsled team, the figure skaters Tonya Harding and Nancy Kerrigan story, while Canadian figure skating pairs Jamie Sale and Davide Pelletier were temporarily robbed of gold medals by a corrupt French judge; who can forget the Ben Johnson (pictured below) scandal or more recently the American runner Tyson Gay who just got his entire teams relay race silver medals taken away because he was later found to be doping. Furthermore, I recall a Chinese gymnast lost her medal because they lied about her age and was too young to compete. 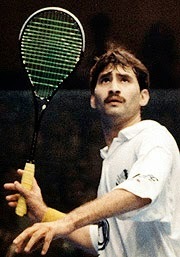 While I also remember badminton teams being kicked out for not playing to their ability. I also remember some controversy with the Canadian women's soccer team, but of course there is controversy in soccer. Could that be why it's so popular? These are just a few of the stories, and like for most of you, these are the most memorable Olympic moments of my lifetime. Of course there are always other controversies when you have judging involved. And I can't go on without saying that I do recall Canada winning a couple of gold medals in hockey, but that was just because I'm Canadian. I'm sure globally those accomplishments have long been forgotten. So what is the point of all this? Well where does squash fit in? 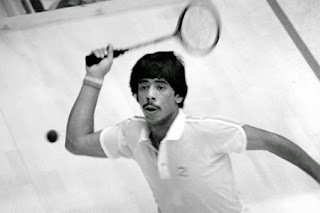 I don't remember hearing any controversy in squash since Jonathon Power retired. Not that I condone how Power carried himself on court, but he definitely spiced things up a bit. In tennis there was controversy about Nikolay Davydenko potentially gambling on tennis. Not that this makes the sport better for tennis players, but it sure does shine the spotlight on a sport in the American culture. Same when Serena verbally abused a line judged who called her for a foot fault. And I'm sure many of you have seen the video clip of Mikhail Youzhny who smashed his racquet on his head repeatedly until he started bleeding. For people not involved in squash, nobody cares who wins and what country they are from. Maybe if there was someone having an affair it would make a sportscenter. The video of Cameron Pilley hitting his brother in the back with a squash ball probably garnered more interest from those outside the squash community than any single accomplishment from a player on tour. Beyond that squash doesn't have a bad rap for cheating or controversy. As a squash player this wouldn't make me enjoy the sport more, I certainly am not hoping for it. But this does make me wonder how this would grow the game we all love. 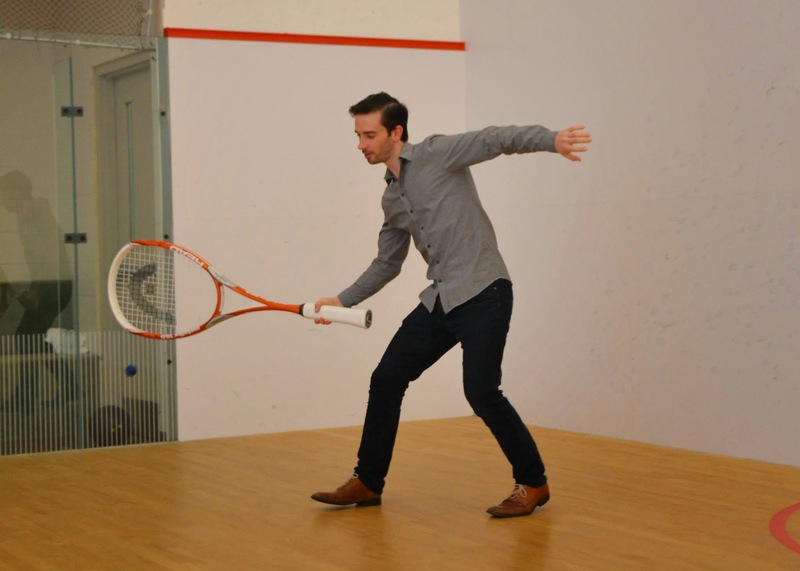 How badly do you want squash to become more popular and make it into the Olympics? Do we need corrupt officials and people caught doping to get capture a bit of the spotlight and gain some public interest? Honestly, this would probably all do wonder. For those that have never played or heard of squash, watching a few rallies of the top players in the world likely wouldn't impress them. The same goes for if I watched biathlon, figure skating, gymnastics, diving or so on. But when we hear that a judge was paid off or someone cheated somehow we all want to watch and see what happened. We want to see for ourselves how someone was corrupted, likely by money or fame. This allows us to think about how much better of a person we are. Of course we would never do that type of thing, which is exactly why we want to watch it. Just like a good action movie or book, the more laws and rules broken the more entertaining the story. So do we need to sell out the sport we love somehow so it gets the recognition it needs? Or would this just be unwarranted attention? 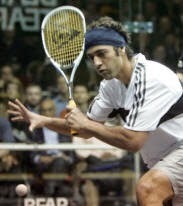 I know in Canada there would be a lot more funding for players and coaching if squash made the Olympics. It's hard to argue against that being a good thing. Well there you have it. I'm sure one day squash will have someone or a few that will stir up the pot. Will we have a Josh Hamilton that constantly relapses? Will we have someone tamper with equipment like the Patriots did? Will someone bribe an official like in the figure skating scandal? Will someone have an affair like Tiger Woods? Will a player gamble large sums on squash like maybe Davydenko in tennis or Pete Rose in baseball? In North America most of the MBL season discussions have revolved around Alex Rodriguez. Who doesn't want to watch know? Probably most hoping he fails. 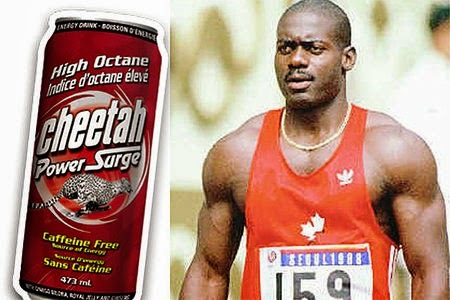 Will a top squash player get caught doping like Ben Johnson or a zillion other baseball and football players? Will someone date a celebrity like most of the pro sporting athletes? Is the reason this isn't already happening because there is no money in professional squash? Or is some of it already happening and it just doesn't get investigated and reported on a mainstream media outlet like all of the other scenarios I've just mentioned? So do we need ore money in the sport to have more scandal? It feels like the chicken and egg dilemma. 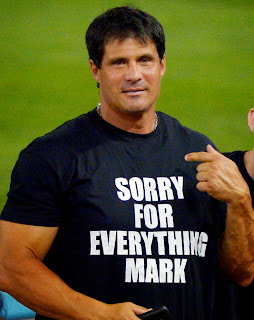 I like the fact that our sport is about the love of the game and that we haven't had people like Alex Rodriguez, Barry Bonds, Mark McGuire or Jose Canseco (pictured below). These people are famous for the wrong reasons and while chasing bigger paycheques tarnished their reputations. I believe that in doing so these athletes have helped increase interest in their sport. If some of these things do begin happening in squash, it would likely increase our exposure and improve our chances of getting into the Olympics. Do you want to see this type of behaviour and scenarios on the PSA tour? 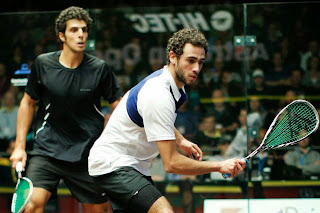 If we have unbelievable ambassadors like Ramy Ashour and Nicol David at this time and still can't get into the Olympics, what chance to have with future generations? Would cheaters and controversy taint our sport? Of course. But would this grow our sport? Without a doubt. Would this give squash the drama piece that many other sports have? Likely. Perhaps this would give people on sporting shows something to debate and potentially get squash into the Olympics. In closing it leaves me with a difficult question; how badly do we want squash to increase in popularity and be included in the Olympic Games? Today is going to be a short post, but an important topic. This will especially be so for most amateur males in particular. Today I'm going to discuss the importance of swinging within yourself. Most of us really enjoy hitting the ball as hard as we can, but pay close attention to the pros game and you'll find this is rarely done. It is not an efficient way to play over a long period of time. It also leaves you off-balanced and slow recovering to the T. At the amateur level it can also be quite dangerous. When you get stuck playing bang ball type of squash you are not really thinking anymore. You are gripping the racquet tightly and this will make it very challenging to ever develop soft hands and a good drop shot. Another big issue with swinging at maximum power is that most people's technique starts getting sloppy. When this happens the ball is hit late and the depth is also way off as well. Hitting out of trouble may work against some people at your level, but players a bit better won't have any trouble exploiting this weakness. If you aren't accurate you will be doing all of the running. If I play someone wild and overhits I just lob the ball and hit it deep to their backhand until they pop out a loose one. Then I hit short and they will be under pressure and this is where they begin doing their court sprints. You know they want to hit it hard and the ball is going to come back deep, so I wait for it and hit the next shot back down the wall. After a few rallies or a game, they eventually punch themselves out. If you want to learn how to hit it harder, you should focus on improving your biomechanics. This includes transferring your weight into the ball, getting your racquet set in time and having the proper spacing when you make contact. If you use your core, torso and legs you will get much more pace on your shots and more efficient power than when you swing for the fences. This is why I titled this post, 'swing within yourself.' As soon as you begin taking an excessive swing to hit it harder most amateurs technique really falls apart. Then both players are at an increased risk of injury! And we already discussed the other issues with trying to overswing. This doesn't mean you can't hit it hard. Just don't put 100% effort into any of your shots. Try maybe 90 or 95% even and you'll find yourself having more control and your shoulder and elbow won't be sore. You may even make it through an entire match without getting completely exhausted. Some people get nervous and overhit early in a match. It's a macho thing. We want to hit it harder than our opponent. This isn't what wins matches at a high level. Power is a weapon, but not the most important one and it certainly isn't an advantage if your swing becomes too big and loopy and you can't control your shot.